All snakes, whether captive born, raised in captivity, or left alone in the wild, have natural hunting instincts. Experienced snake owners recognize that the best way to ensure their captive snakes eat appropriately is to mimic prey-and-predator situations found in nature. Although there are some differences in the ways wild snakes and captive snakes recognize and approach prey, instinct nearly always kicks in when it comes to eating. Wild snakes are opportunistic hunters; they take prey when they can get it to ensure they don't go without. Captive snakes, particularly those fed on a regular schedule, might come to anticipate feeding time. You might recognize when your snake is hungry: He’ll be more active, searching his cage and “hunting” for prey. Most snakes primarily eat rodents such as mice, rats and rabbits. In the wild these animals are usually brown, but when you buy them from a pet-supply company they are typically white. Snakes taken from the wild and into captivity might initially reject white prey because it seems unnatural. You can humor the snake’s eating preference and search for brown feeder rodents, or you can work with him and acclimate him to white prey. Snakes in the wild seek out prey by sensing heat and movement. A captive snake who is fed live prey will exhibit the same behavior. Captive snakes who are fed euthanized or frozen/defrosted prey are relying more on the routine of feeding than on their natural hunting instincts. Snake owners who have a problem getting their snakes to eat dead prey often allow the rodents to warm to room temperature, and they might simulate movement by shaking the prey with long forceps. Wild snakes generally hunt at night, when their typical prey is most active and therefore most abundant. Captive snakes grow into a habit of accepting prey as their owner presents it, regardless of timetable. Snake owners who have picky eaters often have better luck feeding at night, or if they keep their snake cage covered during feeding to simulate darkness. 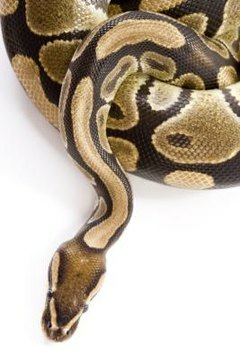 When a snake sheds, it not only sheds the skin covering its body, but the skin covering its eyes as well. Several days before a shed, a snake’s eyes will appear to turn a milky or blue shade, which is actually eyelid skin beginning to lift up in anticipation of molting. In the wild, snakes generally don't hunt for several days before they shed, as their vision is compromised. Captive snakes often exhibit this same instinctual behavior. It can be dangerous to feed a snake before it sheds, particularly if you offer live prey that could bite or scratch your snake while his vision is poor. Do Snakes Become Less Active When They're Going Into Shedding? What Happens When Two Snakes Grab the Same Rat? Why Won't My Snake Eat His Mouse? What Irritates a Garter Snake?